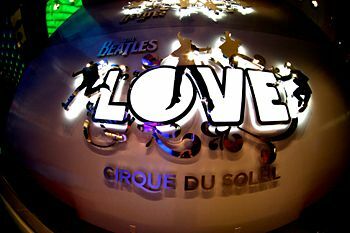 Love is a 2006 theatrical production by Cirque du Soleil which combines the re-produced and re-imagined music of The Beatles with an interpretive, circus-based artistic and athletic stage performance. The show plays at a specially-built theatre at The Mirage in Las Vegas. 25 May	This entry was published on May 25, 2014 at 8:59 am. It’s filed under Documentary, Video and tagged Beatles, Circus, Circuses, Cirque du Soleil, Las Vegas, Love, Mirage, Performing Arts. Bookmark the permalink. Follow any comments here with the RSS feed for this post.